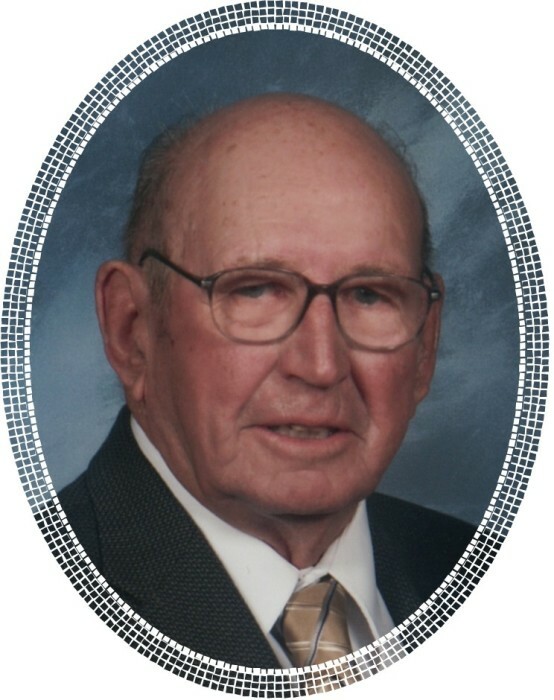 Nordien M. Kulkee, of Lebanon, WI, at the age 99 yrs was peacefully called to his Eternal Home, Monday, March 18, 2019 while residing at Clearview Nursing Home and Rehabilitation in Juneau. Nordien was born December 13, 1919 son of Henry Kulkee and Wilhelmina (nee Schuett) Kulkee. Nordien married Lorina (nee Fredrick) Kulkee on December 20, 1941 at the home of Lorina’s parents and shared his life with her for 74 years. Nordien was a life long member of Bethany Ev. Lutheran Church, Hustisford and served as a trustee. He and Lorina shared a life long ambition of farming on the family farm in the Town of Lebanon. They purchased the family farm in 1955. Nordien was involved in many organizations including the Lebanon Sportsmen’s Club and the Lebanon Volunteer Fire Department. He served on the Lebanon Town Board as a supervisor and chairman, and was also on the Board of Directors of the Lebanon-Clyman Mutual Insurance Company. Nordien is survived by his three children, Linda (Art) Hilker of Janesville, James (Barbara) Kulkee of Lebanon and Christine (Patrick) Koehler of Watertown; 10 grandchildren, Karl (Lisa) Hilker of Waunakee, Katrina (Scott) Pearson of Green Bay, Kent (fiancé Shawna Mack) Hilker, of Janesville, Tina (Luke) Krause of Beaver Dam, Trisha (Kyle) Sippel of Lebanon, Tiffany ( Jason) Pekul of Janesville, Thomas (Jamie) Kulkee of Lebanon, Monica (Jeremy) Hepp of Johnson Creek, Joshua ( fiancé Missy Makovec) Koehler, and Jesse Koehler of Berkley, California. Also, survived by 21 great-grandchildren other relatives and friends. He was preceded in death by his wife Lorina, a brother, a sister and two great-grandchildren. Visitation is Friday, March 22, 2019 from 9 AM-11 AM at Bethany Ev. Lutheran Church. The Funeral Service will follow at 11 A.M. Rev. Jonathan Loescher will be officiating. Interment Hustisford, Cemetery. A special Thank you to the staff at Clearview Nursing Home and Rehabilitation for their dedicated loving care. Memorials to Bethany Ev Lutheran Church would be appreciated. The Berndt-Ledesma Funeral Home is serving the family.